Unpredictable or erratic rainfall patterns are among the consequences of climate change that greatly affect lowland rice farmers in the Philippines. Its effect is deeply felt particularly by farmers in the Ilocos Region, where majority hold less than a hectare of rice land. Because of this, farmers are seeking for drought-adaptive technology. To help address this need, the Philippine Rice Research Institute (PhilRice) in Batac, Ilocos Norte organized a Grand Field Day on 10 November 2015, showcasing innovative and relevant rice farming technologies to help farmers cope with the effects of climate change. Among those who attended were more than 700 farmers, local extension staff, and agricultural college students from four provinces: Ilocos Norte, Ilocos Sur, Abra, and La Union. Senator Cynthia Villar, Ilocos Norte Governor Imee Marcos, and Batac City Mayor Jeffrey Jubal Nalupta graced the occasion. PhilRice and IRRI displayed new drought-tolerant rice varieties (Sahod Ulan series) and small farm machinery (seed drill for direct seeding) with the support of the Consortium for Unfavorable Rice Environments (CURE) project funded by the International Fund for Agricultural Development (IFAD) and the DA-BAR funded Associated Technologies project under the Food Self-Sufficiency Program (FSSP). In her keynote speech, Hon. Cynthia Villar emphasized diversified cropping systems as an important strategy to cope with climate change. According to her, we could achieve this through the use of climate-resilient varieties, making educated loans from legitimate socialized credit, and farm mechanization. On the other hand, Hon. Imee Marcos highlighted the importance of agriculture in the province and her support on the ongoing activities to lessen the damaging effects of climate change. The farmers, on their part, showed interest in obtaining climate-resilient varieties. They believe that the mechanized direct-seeding technology would enable them to plant rice without standing water in the field, and save time for crop establishment. PhilRice Executive Director, Dr. Calixto Protacio, in his closing remarks, said, “We need to be more resourceful, especially in unfavorable areas, and we need to be prepared in relation to the effects of climate change.” Such preparedness includes developing varieties that can withstand El Niño and flooding. Green Super Rice (GSR) Phase 2 project highlighted its achievements for Eastern and Southern Africa (ESA) during a workshop in Uganda. One of these was the release of Okile (GSR I0057=ZGY1) variety in Uganda. GSR is a mix of more than 250 different rice varieties developed to perform well in the toughest conditions where the poorest farmers grow rice. The long-term objective of the project is to boost rice productivity by 20% to benefit some 20 million poor rice farmers in the target countries. During the workshop participants from Uganda, Rwanda, Ethiopia, Tanzania, and Mozambique presented the progress made in their respective countries. Achievements in GSR breeding in IRRI Hubs in Burundi, Tanzania, and countries in West Africa were also presented. Other GSR varieties released in ESA are the weed-tolerant Hua 565, Simiao, and Buryohe. Resource poor farmers in Africa and Asia can benefit from the project because this technology requires less input without sacrificing yield, said Dr. Zhikang Li, project director and chief scientist of Chinese Academy of Agricultural Sciences. Li said that next phase of the project will focus on seed upscaling and the release of new GSR varieties. To meet that goal, the project workshop developed the seed road map and seed upscale strategy for each country in ESA. Careful planning for seed upscale in countries where the GSR varieties were released will be the priority as well as identifying local seed producers and key stakeholders to mobilize the resources for proper seed upscale of promising GSR released varieties, according to Dr. Jauhar Ali, IRRI-GSR project leader and coordinator for Asia and ESA, and Dr. Jimmy Lamo, project coordinator in Uganda. “The GSR project has set up a very good opportunity for a vital role of collaboration,” Li added. Ambrose Agona, director general of the National Agricultural Research Organisation, agreed. “Partnership is a very important element for any project to succeed,” he emphasized. He challenged the participants to come up with a strategy for awareness and promotion such varieties so that people, especially the farmers can really benefit from the project. He also expressed his gratitude to the project for choosing Uganda as one of its target countries. Green Super Rice project aims to reduce poverty and hunger and increase food and income security of resource-poor farmers in Africa and Asia through the development and dissemination of GSR varieties that give high and stable yield without requiring heavy inputs. The African component of the project is coordinated by Africa Rice Center and in partnership with IRRI, national programs of target countries, non-governmental organizations, farmers’ associations and the private sector. The workshop was held at Hotel Africana in Kampala, Uganda on 3-5 November. MANILA, Philippines – The late National Artist Vicente Manansala must have been smiling last night. Jointly organized by the National Museum of the Philippines and the International Rice Research Institute (IRRI), Sharing the Harvest featured the public unveiling of IRRI’s three Manansala studies in the museum’s IRRI hall as well as the launch of the Guide to the birds of Philippine rice fields, and the 2016 Heirloom Rice Recipes calendar. IRRI deputy director general Bruce Tolentino welcomed high-level Philippine government officials, members of the diplomatic corps, and special guests and dignitaries to the "trifecta of events only made possible by the the strength of partnerships." HYDERABAD, India - V. Ravindra Babu, rice breeder and academic leader at the Indian Institute of Rice Research (IIRR), has been appointed as the institute's director effective 9 November 2015. Prior to his appointment, Dr. Babu was acting director since 1 September 2014. IIRR, formerly the Directorate of Rice Research (DRR), is a premier rice research institute under the Indian Council of Agricultural Research (ICAR). Seong-Yool Lee, mayor of Cheongdo County, South Korea, visited IRRI on 11 November 2015 to learn about the historical relationship between Korea and the Institute. The Government of the Republic of Korea has been working with IRRI since 1964. The collaborative research between the Rural Development Administration (RDA) and IRRI resulted in the development of Tong-il rice varieties. The Consortium for Unfavourable Rice Environments (CURE), Vietnam Academy of Agricultural Sciences, and the Northern Mountainous Agriculture and Forestry Science Institute of the Ministry of Agriculture and Rural Development (MARD) organized a consultation workshop on technology transfer for the mountainous and unfavorable rice areas in Central and Northern Vietnam. The activity identified technologies and best management practices that are ready for dissemination and discussed ways to bring them to a greater number of farmers. Technical innovations for sustainable rice production in upland areas derived from CURE and other national and provincial programs were also discussed. The activity focused on strategies for successful promotion of these technologies among the wide range of stakeholders; issues affecting the seed system particularly on the community-based seed production; and identification of national, regional, and provincial programs for upscaling and outscaling innovations. "It is not enough that we generate technologies,” said Digna Manzanilla, CURE coordinator and organizer of the effort. Dr. Manzanilla underscored the importance of partnerships among groups to widen the reach of the technologies. “We need to define the partners and specific mechanisms for sharing these knowledge and resources." Robert Zeigler, IRRI director general commended the group for bringing attention to problems confronting the upland rice communities and for identifying critical steps to provide livelihoods for uplands. Dr. Zeigler encouraged market- and culture- oriented ice production innovations as well. It was also an opportune time to identify areas of complementation between CURE, an International Fund for Agricultural Development grant, and relevant investment projects in Vietnam. Joining this effort are 59 participants from different research institutions of MARD, Center for Technology Development and Agricultural Extension, Agricultural Science Institute of Northern Central Vietnam, Agricultural Science Institute for Southern Central Coast of Vietnam, Fertilizer Research Institute, and the Department of Agriculture and Rural Development Province. Representatives from extension centers, seed companies, and farmers’ seed groups also joined the consultation-workshop. The workshop was held at the Flower Garden Hotel, Hanoi on 9-10 November. Participants were taught techniques on how and where to set up rodent traps along the grassy area of the lowland rice plots at IRRI, Los Baños. Los Baños, Laguna -- A two-week training course on the ecological management of rodents, insects, and weeds in agro-ecosystems is being held at IRRI headquarters on 2-13 November. Thirty participants from the Philippines, Myanmar, Indonesia, India, Sri Lanka, Thailand, and Vietnam attended the training to gain and apply their knowledge of the ecology of rice pests for better rice farm management at a landscape level. They were trained in using decision tools to analyze pest problems and determine processes and factors that influence farmers’ decisions; applying field protocols for monitoring insects, rodent and weeds; simple computer models; and the principles for effective transfer of knowledge to extension officers, policymakers, and farmers. The International Rice Research Institute (IRRI) and the National Museum will hold a trifecta of grand events celebrating the genius of National Artist Vicente Manansala, heirloom rice treasures of the Cordilleras interpreted for the palate by the country’s top chefs, and the breathtaking natural beauty and awe of wild bird diversity in the Philippines. Sharing the harvest, on 12 November 2015, at 6:30 pm at the National Museum, spotlights the original studies (rendered in watercolor) of the two large Manansala paintings that opened for public viewing in the museum’s IRRI Hall on 14 May 2015. Another study of the artist’s oil painting Prayer Before Meal will also be on display for the first time. during the opening of the 1st MARD-CGIAR Coordination Meeting in Hanoi (6 November 2015). HANOI, Vietnam – Seeking stronger complementarity in their joint research for development programs, leaders of the Ministry of Agriculture and Rural Development (MARD) of Vietnam and the 10 CGIAR centers operating in the country, as well as other national partners, sat together on 6 November 2015 for the 1st MARD-CGIAR Coordination Meeting. The meeting, convened by MARD with the help of the IRRI Vietnam office, was headlined by MARD Minister Cao Duc Phat and International Rice Research Institute (IRRI) Director General Robert Zeigler. Minister Phat and Deputy Minister Le Quoc Doanh co-chaired the afternoon and morning sessions, respectively, with Dr. Zeigler. IRRI, in partnership with the HealthServ Medical Center, and the Municipality of Los Baños provided free medical service for residents of Los Baños who are 60 and over. One hundred fifty seniors from 14 barangays received free medicine, vitamins, laboratory tests (urinalysis, bone scanning, cholesterol scanning, and random blood sampling), and health care counseling from volunteer physicians. In addition, the IRRI Employees' Credit Development Cooperative provided free snacks. The free healthcare service, held on 5 November, is one of IRRI's regular community engagement programs to increase the wellness of senior citizens and help reduce the incidence of common medical problems in its host community. IRRI, through its partnerships and transport offices, turned over three vehicles to the Department of Agriculture Bureau of Agricultural Research (DA-BAR) and a car to the Philippine Rice Research Institute (PhilRice). DA-BAR Administrative and Finance Division Head Roberto S. Quing, Jr. and PhilRice Acting Branch Director Diego Ramos visited IRRI to accept the vehicles. IRRI Deputy Director General for Communication and Partnerships Bruce Tolentino and Property and Transport Services Head Arman Mohammad conveyed IRRI's support for its government agency partners during the turnover ceremony held at IRRI HQ on 6 November. 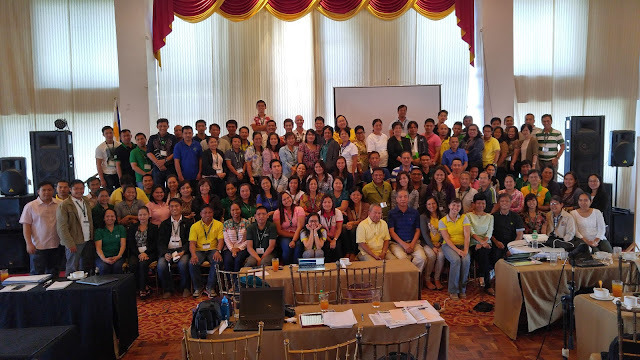 Agricultural extension workers (AEWs) who help in the delivery of research results to farmers were trained to use different knowledge resources in rice farming in a seminar held at the Provincial Capitol of La Union, San Fernando City on 3 November 2015. IRRI Training Center’s Lauro Atienza gave a presentation on the Rice Knowledge Bank (RKB) and Rice Doctor (RD). 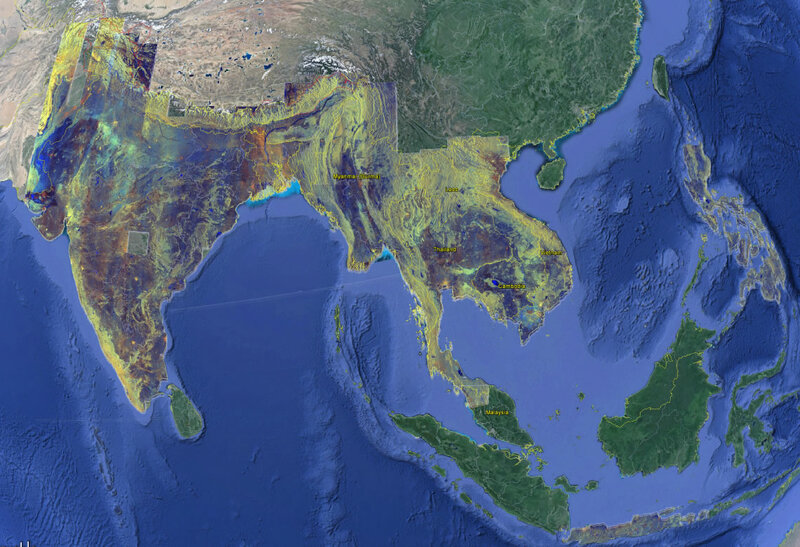 RKB is an online source of information on rice farming, from pre-planting to post-production. Rice Doctor is a diagnostic tool on crop problems, pests, and diseases. Both of these tools are available online through www.knowledgebank.irri.org and ricedoctor.irri.org. They also have offline versions that can be downloaded through the Google Play Store. In the seminar, representatives from the Department of Agriculture and from the Philippine Rice Research Institute (PhilRice) also presented other tools such as the Pinoy Rice Knowledge Bank, MOET App, PhilRice Text Center, and the Rice Crop Manager. The seminar was attended by around 80 AEWs from different cities and municipalities of the province of La Union. 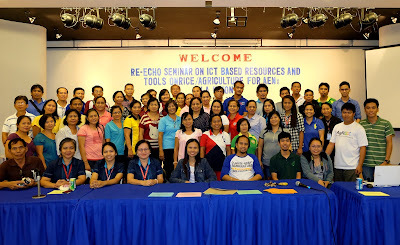 It was organized by graduates of the first batch of the AgriDOC (Agricultural Development Officers of the Community) training given by the IPaD Project. In addition, a group of 40 farmer technicians and extension workers from the province of Davao were also introduced to the RKB and RD during their visit to IRRI also on 3 November. Jerome Barradas of IRRI’s Training Center led the presentation and discussion. The Young Researchers' Lunch for October hosted Robert Zeigler. Zeigler has been the director general of the International Rice Research Institute (IRRI) for the last 10+ years—the second longest tenure after Robert Chandler. As DG, he sets the institute’s strategic direction and he has also been a passionate spokesperson on a wide range of issues that affect rice growers and consumers worldwide. Zeigler, who is retiring at the end of the year, shared stories about his career trajectory as well as amusing anecdotes about quirky colleagues and exotic food. He said an early opportunity to attend a training course on management was important in helping him understand other people's perspectives, giving him an advantage in his leadership roles. His message to the group, "Enjoy what you do, and do something that is meaningful to you." “The IRRI experience is number one in my career—without a doubt,” Zeigler said in his Pioneer Interview for Rice Today. “The job as IRRI director general is unlike any other job you can ever possibly want. Science, its value in human terms, the impact you can have positively on the environment—you can transform the way the whole planet will function decades from now, a century from now. What happens at IRRI is relevant." The participants were Abraham Darius Llave, Terry Velasco, Manas Ranjan Prusty, Renee Lorica, Majid Mortazavi, and Hongyan Liu. The Young Researchers Lunch is a monthly meeting for scientists who are in the early stages of their career, with the purpose of providing mentorship opportunities with senior scientists on a range of topics, including research and career paths.